I have always loved vauge beautiful lyrics, I’m not sure why but there’s something about them that just draws me in. In my mind Nickel Creek is the best at these! I love their first cd and it’s one of my favorites of all time. Several of my favorite quotes are found in this song, which is one of my favorite off of the cd, expect to see lots more from them in future Tuesday Tunes!! This is a beautiful song, if you’ve never heard it hop on over to You Tube and listen!!! I have always loved Sara Evans music, and was super excited to get the chance to review her very first novel! The Sweet By and By is a story about Jade and her struggle to make peace with all the skeletons in her closet before she marries her true love. The road there isn’t easy, as she thinks it would be just easier to shove them back into the closet where they belong, this doesn’t prove to be easy once her hippie mom shows up, dragging all of Jade’s baggage messily with her. This is a story of hurt, past demons, and ultimately the kind of forgiveness that only peace with God can bring. The characters were realistically flawed and showed the consequences a life of sin will bring, and the writing was extremely easy to read. I finished the book in 2 days. As a conservative Christian I felt the book was a little on the liberal side of Christian, and was disappointed that salvation was never clearly explained. It seemed to always be linked directly to baptism, or a “moving emotional experience”, which I don’t agree with. The style of the book reminded me somewhat of Karen Kingsbury’s writing and if you enjoy her novels then I’m sure you will enjoy this one as well. In all I liked and would recommend it, but only with a word of caution. I did like it enough that I will probably read the follow up book when it comes out. Special Thanks to Thomas Nelson for providing me with this book to review! I Heart Faces ~ Happy Birthday! 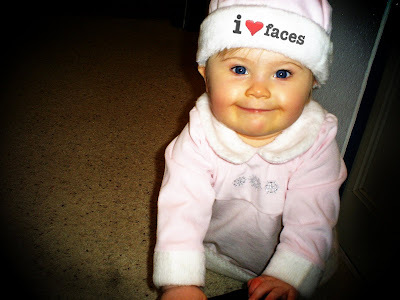 It’s i ♥ faces very first birthday! I so enjoy entering the photo challenge each week even though I know I don’t have a prayer to win, lol. (They allow professional entries so my stuff is definitely sub-par!!!) I just love this picture of Amber because I think it makes her look just like a little elf! This week they’re having a super fun contest so be sure to hop on over and view all the other fantastic faces on their blog! Author NicolePosted on January 4, 2010 May 25, 2014 Categories I ♥ Faces11 Comments on I Heart Faces ~ Happy Birthday! 2010 should prove to be a red letter year for the Elliott family. The first major change happens today as Bob is now officially ME3 Elliott in the Coast Guard. This year will also bring our 5th anniversary, my 25th birthday, an out of state move, and a new baby. So here’s to 2010, I welcome you with open arms and can’t wait for all the new and exciting changes you will bring!!! !